Each year that we perform our benchmark report surveys for the green industry and the snow industry, we see that hundreds of field service professionals are seeing the benefits of having an updated website that is tailored for their location and their expertise. In years past, we saw a much greater number of businesses that didn’t even have a website. More and more businesses are having sites built or even doing it on their own with platforms such as Squarespace. If you’ve done much research on the requirements for a local business website that sells, you’ll likely have seen the term Search Engine Optimization. SEO is the practice of creating the best web presence possible through optimizing for multiple components, including keywords on a topic, on your website. As a smaller and local business, it can be kind of daunting to attempt to compete with large corporations with huge budgets. But there are ways that even the smallest field service businesses can rank higher and win against the giants. Blogging, when done right, can pay huge dividends. As a business that serves a smaller geographic area, there is an advantage that you hold over large corporations. You know your clients’ issues, the area and the work that you provide. In other words - you are the expert in your field. And the best part about blogging is that the only thing it costs you is your time. 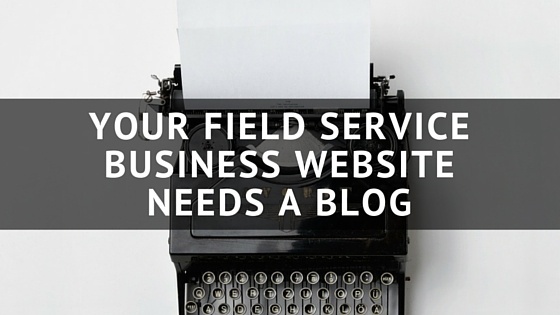 Here are a few of the reasons you need to start (seriously) blogging for your field service business. When you start blogging regularly, you’re consistently creating fresh content around your area of expertise. When you write about your industry, you’re creating content that is shareable and valuable to audiences that you are trying to reach. According to HubSpot, a marketing automation software, companies who blog receive 97% more links to their website. Building links is an important aspect of Search Engine Optimization. It is a form of proving authority and that your content is trustworthy. If you’re writing about topics that you know inside and out, you’re displaying your expertise before a potential customer even interacts with you personally. It proves you know what you’re talking about and that you explain your trade to others. Where you have an upperhand on larger corporations is knowledge of your location, use that to your benefit and it will pay off greatly in your local SEO efforts. Since you likely work in a specific area, it is easier for you to write about area specific topics. Blogging gives your brand a voice. You’re able to humanize your field service business. People are more willing to interact with a brand that they can connect with. Potential customers want to see what your company stands for and that there are humans behind the brand before they start the buying process. Social media can be tough to do well, especially as a smaller business. It can be difficult to find relevant topics to share with your audience and to do that consistently. But when you blog, you can use your social media accounts to post about the topics you’ve been covering in your blog. It can help drive traffic to your blog and it makes sharing on social media a whole lot easier for you. Need a few more tips on boosting your website to the top of the search engine rankings? Download your free copy of Local SEO for Green Industry Businesses today!